A series of nano-granular films composed of magnetic metal (Fe65Co35) granules with a few nanometers in size and semiconductor oxide (ZnO) have been fabricated by a magnetron sputtering method, and excellent soft magnetic properties have been achieved in a wide metal volume fraction (x) range for as-deposited samples due to the exchange coupling between FeCo granules (a ferromagnetic interaction in nano-scale). In a wide range (0.53 <x < 0.71), the films exhibit coercivity H C not exceeding 15 Oe, along with high resistivity. Especially for the sample with x = 0.67, coercivities in hard and easy axes are 1.43 and 7.08 Oe, respectively, 4πM S = 9.85 kg, and ρ reaches 2.06 × 103 μΩ cm. 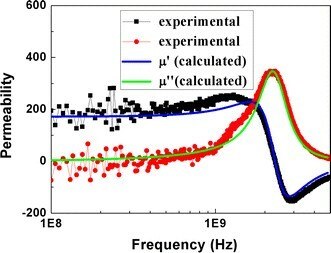 The dependence of complex permeability μ = μ′ − jμ″ on frequency shows that the real part μ′ is more than 100 below 1.83 GHz and that the ferromagnetic resonance frequency reaches 2.31 GHz, implying the promising for high frequency application. The measured negative temperature coefficient of resistivity reveals that may be the weak localized electrons existing in samples mediate the exchange coupling. Recently, magnetic thin films used in magnetic components, such as inductive devices and magnetic heads,have attracted more and more attention because of the increasing demand for improvement and miniaturization of electromagnetic devices [1–3]. The basic requirements for these films operated in the GHz range are high resistivity ρ, high permeability μ, high saturation magnetization M S and appropriate large anisotropy field H K so as to effectively suppress eddy current loss and to possess high ferromagnetic resonance (FMR) frequency f r (which determines the cut-off frequency for high frequency application). Metal–insulator granular films (MIGF) consisting of magnetic metal nano-granules uniformly distributed in an insulator matrix are one of the best candidates for satisfying above demands, because these films have the advantages of high M S and high μ of magnetic metals and high ρ of insulator. Up to now, soft magnetic properties of granular films composed of magnetic metals (and their alloys) and various X-(oxide, nitride and fluoride) where X is nonmagnetic elements such as Hf, Al, Si, Zr, rare earth, etc. have been investigated [4–8]. The mechanism of the soft magnetic properties of MIGFs has been confirmed to be the exchange coupling between granules through the intergranular regions [9, 12]. However, the microscopic origin of exchange coupling has not been totally understood, such as the medium of the exchange coupling for different constitution nano-granular films. By considering the high resistivity of semiconductor oxides, metal–semiconductor granular films (MSGF) consisting of magnetic metal nano-granules uniformly distributed in semiconductor matrix, such as the FeCo–ZnO systems, may possess good high frequency properties. As one kind of wide used semiconductor oxides due to the excellent electrical and optical properties, the current carriers of ZnO may mediate the exchange coupling between magnetic granules and hence favor good soft magnetic properties. 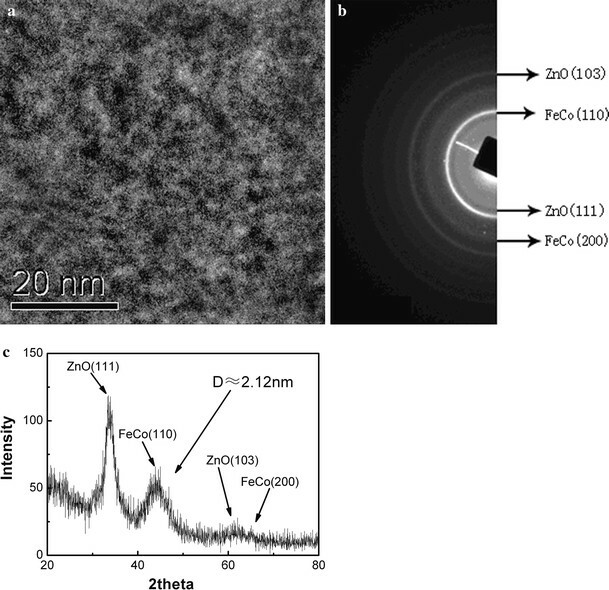 So far, there is no work studying systematically the soft magnetic properties of the FeCo–ZnO granule films reported. 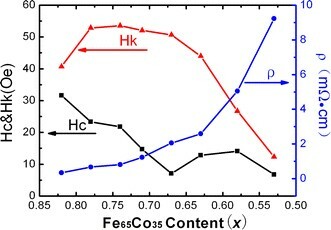 In order to test whether ZnO can mediate the exchange coupling, the structure, magnetic properties and electronic transport properties of FeCo–ZnO MSGFs were systematically studied in this work. (Fe65Co35) x (ZnO)1−x granular thin films were deposited on water-cooled glass substrates by radio frequency (RF) magnetron sputtering at room temperature with a background pressure lower than 4 × 10−5 Pa. A three-inch Fe65Co35 alloy disk covered with ZnO chips (5 × 5 × 1 mm3) was used as the sputtering target. The sputtering power was 100 W, and sputtering Ar gas was kept at 0.40 Pa. The thickness is about 185 nm for all samples. An external magnetic field obtained by a pair of permanent magnets located on both sides of the substrates was applied during deposition to induce an in-plane uniaxial anisotropy for the samples, and the intensity of external magnetic field is 500 Oe. The saturation magnetization 4πMs, coercivity H C and in-plane magnetic anisotropy field H K were determined by a vibrating sample magnetometer (VSM, Lakeshore 7304 model). The composition of the samples was measured by energy dispersive x-ray spectroscopy (EDS). The resistivity was characterized by a dc four-probe method. The structure and microstructure were analyzed by X-ray diffraction (XRD) (Philips X’Pert model) with Cu-Kα radiation and high resolution transmission electronic microscopy (HRTEM), respectively. The film thickness was measured by a surface profile-meter (Dektak 8). The permeability spectra were carried out with a PNA E8363B vector network analyzer using the shorted microstrip transmission-line perturbation method , which works from 100 MHz to 5 GHz. All the above measurements were performed for as-deposited samples without any post-heat treatment. Figure 1 shows the bright-field HRTEM image (a) and the corresponding electron diffraction (ED) pattern (b), as well as the XRD spectrum (c) for a typical sample of x = 0.67. It can be seen that the sample consists of bcc Fe65Co35 particles embedded uniformly in the insulating ZnO matrix from the image (a). The average size of Fe65Co35 particles and the distance between them are about 2 and 4.5 nm, respectively. Figure 1b exhibits the diffraction peaks from (110) and (200) planes of bcc Fe65Co35 alloys, (111) and (103) planes of ZnO, respectively, which are totally consistent with those of XRD shown in Fig. 1c. The average diameter of Fe65Co35 grains calculated by the full width at half maximum (FWHM) of the diffraction peak in XRD spectrum through Scherrer’s equation is about 2.1 nm, which is close to that of Fe65Co35 granules. Figure 2 expresses the x dependence of H C, Hk and ρ. It is seen that ρ increases slowly with decreasing x and then increases rapidly after x < 0.64. H C is less than 15 Oe, and H K is over 43 Oe in the range 0.63 <x < 0.72, which means good soft magnetic properties are obtained in this range. Especially, for the sample with x = 0.67, its in-plane hysteresis loop shown in Fig. 3 exhibits a good uniaxial anisotropy with H K = 50.7 Oe. 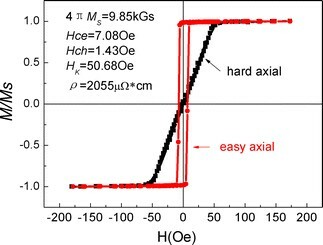 The coercivities in hard and easy axes are 1.43 and 7.08 Oe, respectively, 4πM S = 9.85 kg, and ρ reaches 2.06 mΩ cm, which is three orders higher than that of pure FeCo alloy. These good soft magnetic properties and the high ρ imply that the films are promising for high frequency applications. Figure 4 shows the dependence of complex permeability μ = μ ′ − jμ″ on frequency f for the film of x = 0.67, where μ′ and μ″ represent the real and imaginary parts of complex permeability, respectively. It can be seen that μ′ is more than 100 below 1.83 GHz and then gradually decreases with frequency, while the imaginary part μ″ gradually increases to a maximum at f = 2.31 GHz, which can be ascribed to the ferromagnetic resonance (FMR) . The measured μ ~ f curves were fitted well with the solution of Landau–Lifshitz equations taking account of the coherent spin procession [12, 13], as shown by the solid lines in Fig. 4. The FMR frequency obtained by this fitting is around 2.31 GHz, consistent with the experimental result. The high FMR frequency also implies that the granular films are promising for applications in the high frequency range. Considering the mechanism of the good soft magnetic properties, we turn to the exchange coupling model. According to the Herzer’s statement , if the average size D of magnetic particles and the distance S between particles are reduced to be smaller than a characteristic length, namely, the exchange length L ex, the exchange interaction between particles may take place, which tends to align the magnetic moments of neighboring particles parallel and so overcome the magneto-crystalline anisotropy and the demagnetization effect of individual particles. As a result, the effective magnetic anisotropy of materials is reduced significantly, which leads to the decrease in coercivity and hence the increase in permeability, and then good soft magnetic properties are obtained. For Fe65Co35, the characteristic length L ex is about 26 nm , while the D and S are 2.3 and 4.5 nm, respectively, based on the results of HRTEM spectrum. Thus, (D + S) ≪ L ex holds, exchange coupling can be realized in this film, which is responsible for the good soft magnetic properties. 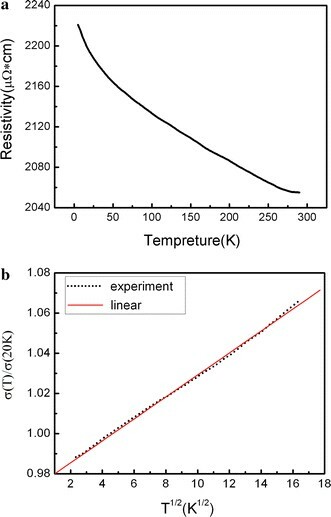 In order to study the microscopic origin of the exchange coupling between granules, the temperature dependence of resistivity was measured from 5 to 290 K for the sample of x = 0.67. Figure 5a depicts the curve, which exhibits a negative temperature coefficient of resistivity (TCR). This curve can be fitted with very well as shown in Fig. 5b, which indicates that the mechanism of electronic transportation of the sample is weak localized electron–electron interaction . These weak localized electrons may also be the medium of exchange coupling between magnetic granules. (Fe65Co35) x (ZnO)1−x granular films were fabricated by magnetron sputtering, and good soft magnetic properties have been obtained in x range from 0.63 to 0.72 with small H C and appropriate large H K . For the typical sample of x = 0.67, the coercivity of 1.43 Oe in the hard axis and 7.08 Oe in the easy axis are obtained, and the resistivity reaches 2.06 mΩ cm. At a frequency lower than 1.83 GHz, the real part of the complex permeability of this sample is more than 100, and the FMR frequency reaches 2.31 GHz, which implies that the film is promising for high frequency applications. The good soft magnetic properties origin from the exchange coupling between magnetic granules and the weak localized electrons existing in films may be the medium of this exchange coupling. This work was supported by National Natural Science Foundation of China (Grant No.50571041).